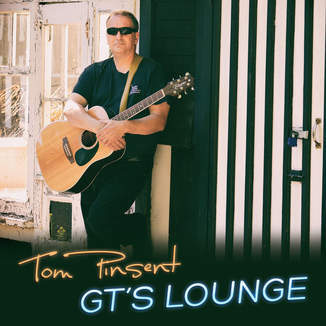 Tom Pinsent was born and raised in Grand Falls Windsor, Newfoundland, Canada. Throughout high school he played drums in bands in his hometown and surrounding area. One of the bands, Union Street, a top 40 band, became very popular and traveled extensively throughout Newfoundland and Labrador. Although still in his teens, he left Union Street as he wanted to start a career and joined the Canadian Armed Forces. After completing training he was posted to Canadian Forces Base Gagetown, New Brunswick. While in Gagetown he met some other musicians who would have a great impact on his life as they formed another top 40 band called Odessey. The band played in New Brunswick for a number of years until Tom was posted again. However, the band members remained good friends and one of the members of this band Peter Brandt co wrote one of the songs on Tom’s latest album GT’s Lounge called “Kid Like Me” that pays tribute to the men and women who serve in the Canadian Forces and have died in battle. After leaving the Canadian Forces, Tom completed a Business Degree and became a business instructor at the College of the North Atlantic in his hometown. Once home in Grand Falls Windsor he began his music career again both as a drummer in top 40 bands and as a guitar player in acoustic duos. It was through playing in duo’s that Tom not only honed his skills as a guitarist and singer, but, began to experiment with writing songs. After trying to persuade his band mates to record, he decided in 2014 to record some songs as a solo artist at Sevenview Studios. The first few song sessions went so well that he decided to record an entire album of original songs. Prior to the release of the album one of the songs called Life Goes On was released on line to ReverbNation where it went to number 1 on the their charts in Canada. While the on line site had its limitations, he viewed the site as a testing ground for the song and it appeared people liked it as the response was very positive. In September 2014, the album titled GT’s Lounge was released in stores in Newfoundland and on iTunes and Google worldwide. As Tom states “Many of the songs are from personal experiences and things that I have seen and done in my lifetime”. Reviews of the album have compared Tom’s style to John Mellancamp, Bob Seger, and even one DJ in the UK called Life Goes On to have a Clapton like feel to it. Tom prefers to let others decide what genre it falls into and says the style is whatever comes out. The album has received great reviews and airplay in the UK and other countries in Europe. Radio Caroline, Radio Deeside, Triangle Radio and Quasar Radio have the album on regular rotation and most of the album has been featured on a weekly two hour radio show called The Music Truffler which is hosted by Kathy Barham. In their year-end review, radio show hosts on Radio Deeside and Quasar Radio have listed GT’s Lounge as one of the best albums of 2014. In addition, the Music Truffler has also placed GT’s Lounge as one of the top albums of 2014. Quasar Radio has added Tom Pinsent’s name on its scrolling list of artists with the likes of Genesis and Pink Floyd. (http://www.quasarradio.uk/ see image below) Tom considers this a great honor by the owners and DJ’s at these stations. In support of the album, a video has been released on YouTube for Life Goes On. Another video is in the works for release in March 2015. Tom and his band played shows in 2015 and 2016 promoting GT’s Lounge and recording a new album which is being released in 2017 called Living Chains. One of the pre released singles Simple Man is now available on line. Tom and the band are looking forward to getting out and playing songs from the new album as well as ones from GT’s Lounge. The new album is now available on all digital outlets and will be released to stores in March 2017.